It was always so easy to hurry on past Exeter, on the way to the seaside resorts of Devon and Cornwall. But there are good reasons to resist the siren call of the beach, at least for a while. My list of the things to see and do in this ancient Devon city include Britain’s prettiest cathedral, one of the world’s narrowest streets and a prince’s prize-winning museum. And there are free, daily guided walks too. 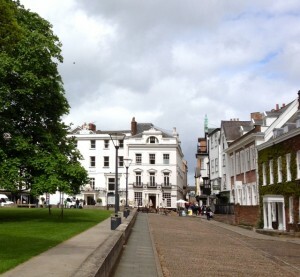 Exeter has an appealing tourist institution, the Red Coat Guided Tour. Walks are free, leaving most mornings from the city centre, taking in the Norman Castle, Roman wall, cathedral and colonnaded Guildhall, possibly England’s oldest municipal building still in use. Other tours take in the historic Quayside area around the canal and the river Exe. The medieval bridge leads to restored Cricklepit Mill. Then do your own exploring through Georgian crescents and past black-and-white-timbered buildings. Gandy Street is one of the old cobbled side streets of character. Parliament Street, just 25 inches wide in one place, is among the narrowest anywhere. There’s a two miles circular walk around the old city, through the city’s famous formal gardens. Topsham is a gem of a little town, on the Exe Estuary four miles from central Exeter. Stroll there along the very first English canal to use locks. Once a larger port than Exeter itself, It has a proud shipbuilding and maritime history. The story is told in Topsham Museum, in the Strand, a riverside street with some notable 300 year old merchant houses in the Dutch style, with curved gable ends. There are antique shops, tea rooms, pubs and some good restaurants. Something else to see out of Exeter is 14th century Powderham Castle, a setting for The Remains of the Day, starring Anthony Hopkins and Emma Thompson. Honition, 16 miles north east and famous for its lace making, is another visit. Allhallows Museum has a big collection of local lace.